Enjoy of a risk-free service in Limehouse that has earned over 95% of positive customer feedback! Q: What does the window cleaning in Limehouse consist of? A: Our service will be performed by seasoned and police-checked Limehouse window cleaners. They'll also don branded uniforms, so you'll easily notice them as soon as they arrive at your premises. A: In essence, this is a telescopic pole that blasts water under high water pressure. It allows the experts to reach the fourth storey of any commercial or residential building without having to climb the rooftop. Q: Will you link your gadget to my building's water source? A: Not at all! The specialists will use a special purified water tank inside their vehicle. However, if the tank is empty, we will gladly accept your offer. A: You must make sure that there will be a empty parking space within 30 metres from your premises and on the same side of your panes. The experts also need to have an effortless access to your property. For the past ten years, our window cleaning Limehouse service has always brought satisfactory results at the most competitive prices in your district. You can find our fees in our short price table below. Depending on your needs, our window cleaning Limehouse can supply you with three choices. 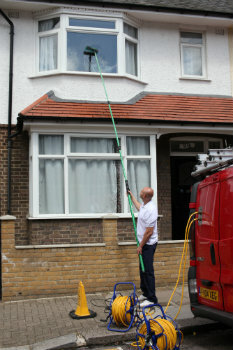 If you pick external cleaning, the specialists will deploy a special water-fed rod. This cleaning tool can expand up to 22 metres in length, which is equivalent to the height of a four-storey building. The Limehouse window cleaners will use filtered water under high pressure that will rinse away all streaks in almost no time. If you own a lofty property instead, then have a loot at our rope access window cleaning. There, a team of certified abseilers will diligently clean your windows until they witness the mirror image of the setting sun. For your comfort, we check the washing equipment on a day-to-day basis and can provide COSHH documentation at your request. For interior cleaning, the adepts will use ladders and sponges to ensure that even the highest spots will benefit from proper treatment. In our aim to help as many Londoners as we can, we've widened our window cleaning in Limehouse to include extra areas across the metropolis. For your comfort, we've mentioned the names of these nearby locations below. For those of you who'd rather book window cleaning services Limehouse E14 online, fill in our get a free instant quote form.